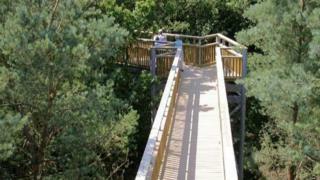 Plans to reopen a popular aerial walkway have been postponed after a surveyor's report revealed the extent of work needed. The cost of repairing Tree Top Way, in Salcey Forest, Northamptonshire, is said to be "beyond" the Forestry Commission's budget. The raised walkway closed to the public in May 2018 following safety concerns. A Forestry Commission spokeswoman said it was "working hard behind the scenes to find a way forward". "We have been overwhelmed with the passion felt for Salcey Forest's Tree Top Way," she said. "As the walkway had reached the end of its life, the full surveyor's report has found that the work required to make the structure safe is beyond the Forestry Commission's standard budget. "We are currently looking for other ways of securing the funding required to repair and reopen the Tree Top Way so it can be enjoyed for years to come." The Forestry Commission had hoped to preserve the walkway by reconstructing the lower section after getting advice from engineers. More than 32,000 people previously signed a petition calling for the attraction, which is 15m (49ft) above the ground, to be saved. The walkway opened in 2005 and had about 250,000 visitors a year.